we’ve been running since 2004! 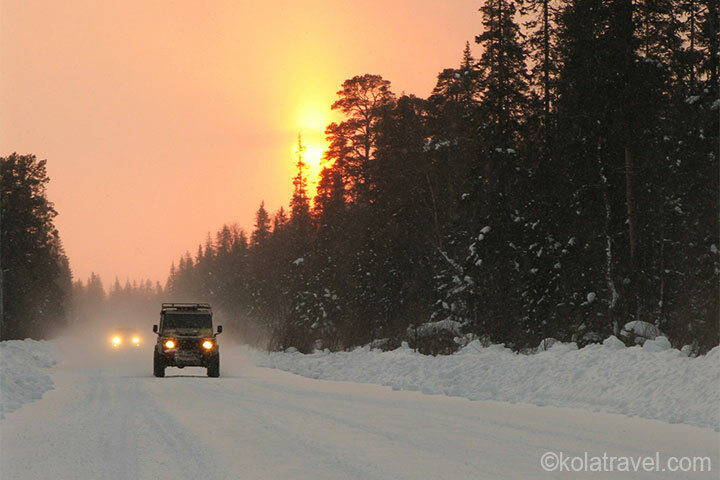 4x4 Arctic Winter Off-road Expeditions for 4X4 cars/trucks. 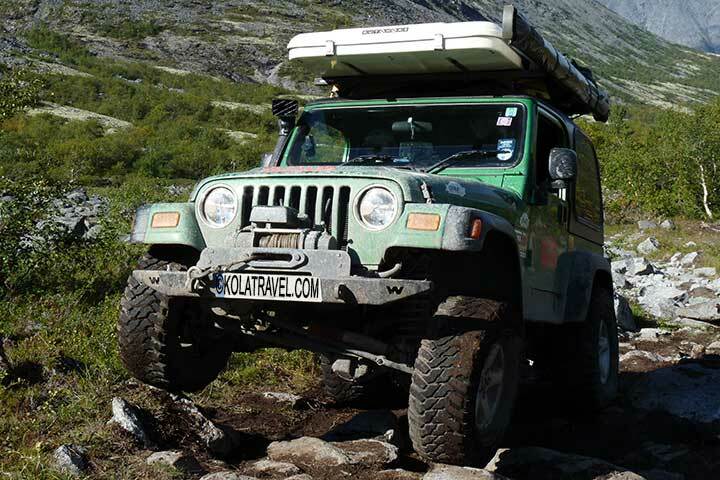 4x4 Arctic Off-road Expeditions for 4X4 cars. 4x4 Arctic Off-road Expeditions for 4X4 trucks. 4x4 Arctic Off-road Expeditions for Enduro motors. with luggage and fuel transport! 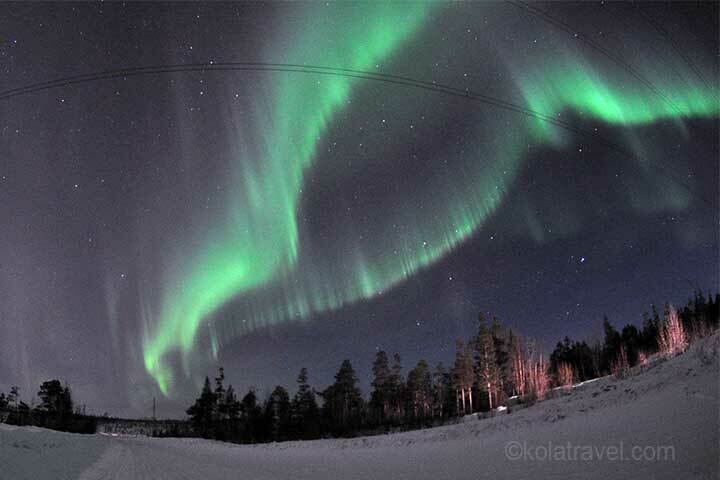 The Kola Peninsula in Arctic Russia is simply like no where else on planet Earth, so expect everything on our amazing off-road expeditions! This is the place you’ve dreamt about every time you went green-laning, this is what every modification you ever put on your truck is for... it’s Europe’s last true wilderness and is pure off-roading heaven! During our off-road expeditions you’ll tackle every type of off-road terrain imaginable; mud, rocks, sand, log bridges, river crossings, routes that take you into the sea, many days, without seeing a spot of tarmac ... maybe even some snow! This is something that other off-roaders only dream about... staying deep in the forest. Totally self-sufficient. Camping wild, spending every night in a tent in the woods, gathering firewood, cooking on campfires, fishing for our dinner. 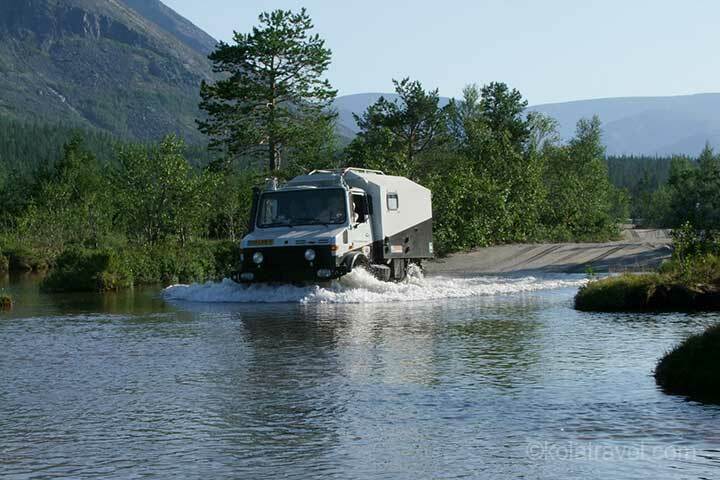 Proving our claim that this truly is the ultimate off-roading expedition! Out of the first town there are no houses with drainage, electricity or running water, so you will go a couple of days without a shower. 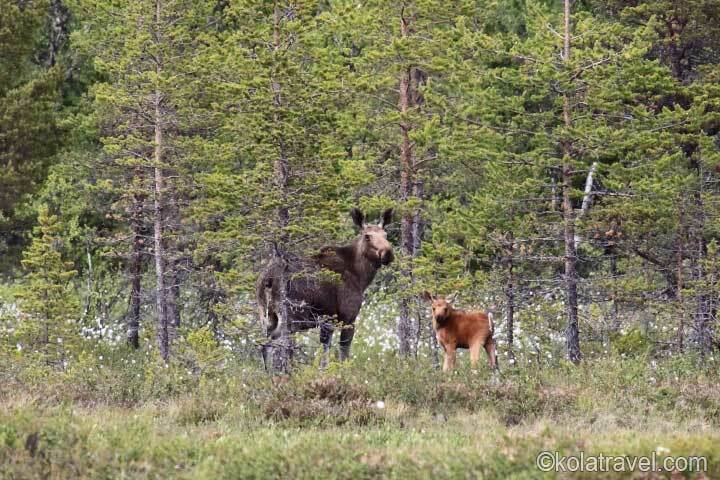 On the tracks we have a couple log cabins on the White Sea shore, an amazing traditional turf-covered Sami dome house, a large wooden lodge in the forest, and some houses of locals with sauna’s, but most the nights it is wild camping out in the pristine wilderness. We’ll have leisurely lunch stops where we’ll build a fire in the woods and will have excursions to things like a Mesolithic stone monument, the rests of a Stalinist labour camp, a left amethyst mine and the Russian version of Rescue centre. Who can participate on these 4x4 expeditions? Many people wonder if their vehicles are capable enough for this tour or worry that the routes will cause damage, but although this is a very rough tour with many challenging trails, vehicles do not have to be tricked-up to the hilt. On the moderate rated off-road expedition most standard 4x4 cars and (camper)trucks will cope fine with everything that we come across, as you can see if you look through the slides of our previous tours, we’ve had L200’s, Hilux’s, GL’s, Navarra’s, Defender’s, Discovery’s, Landcruiser’s a.s.o. 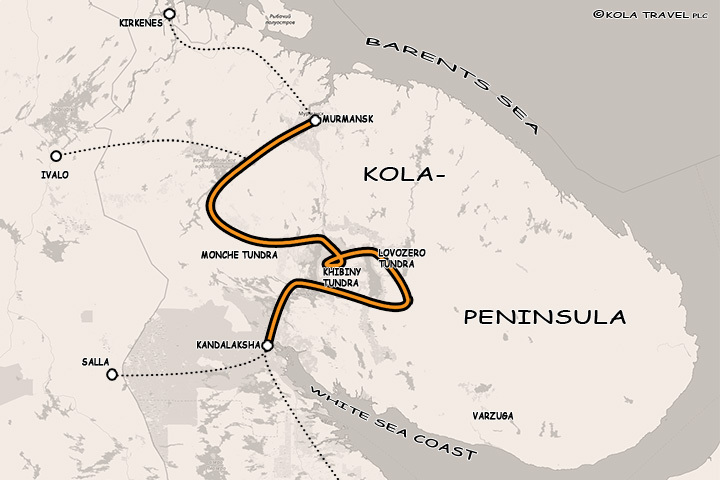 We even organise this expedition for participants with endoro motorcycles. During the enduro motor expeditions baggage and fuel transport is arranged so that the participants can enjoy themselves freely. On the expeditions with rating hard and extreme can only participate well-prepared 4x4 cars and light 4x4 trucks. 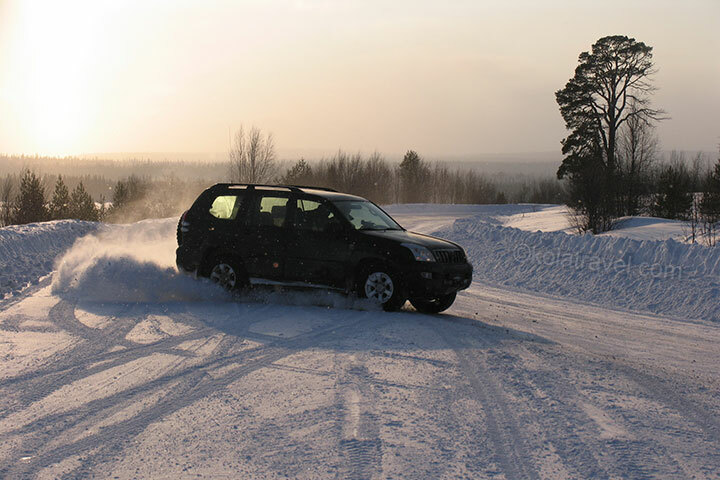 Also in winter we organize an off-road expedition for 4x4's and an ice-road adventure for SUV and 4x4 cars. Look at the options in the overview. For more details, please contact us. All the driving is slow and controlled and you will have the full attention of the guides on the trip. Each day we will give you detailed briefing of the coming routes and if you are not happy to tackle the route we will find you an easier alternative. You can choose from 5 different expeditions based on 3 routes. 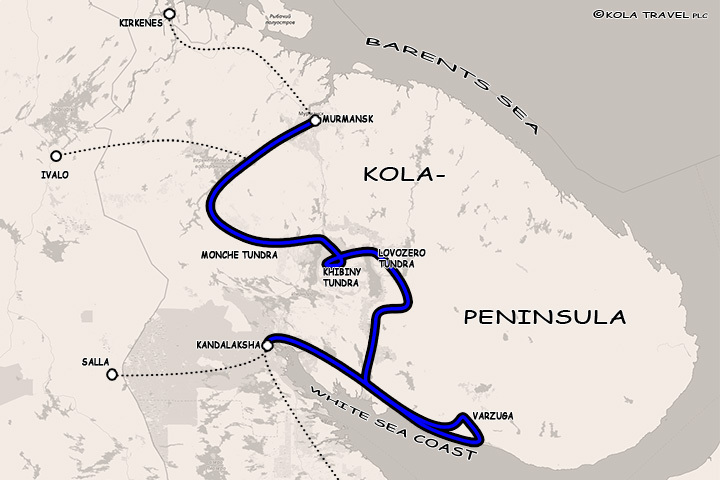 Each expedition consists of several parts like the White Sea part, Khibiny Tundra, Lovozero Tundra and the "Lost World" part. 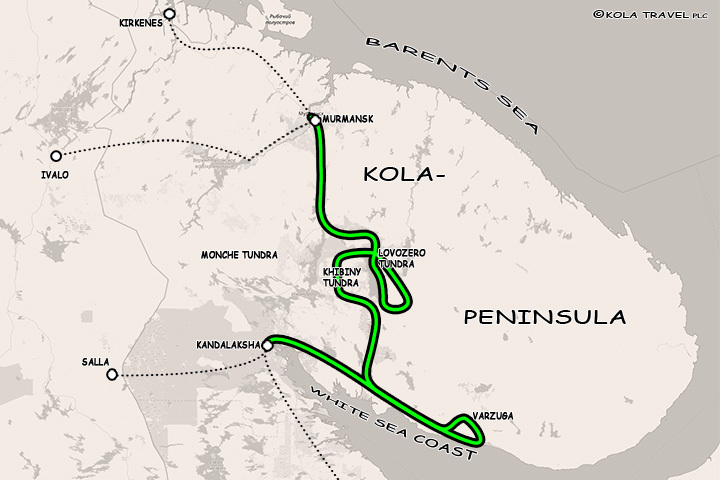 The parts are connected by off-road routes. In the Arctic Off-road Expeditions Overview below you will find the links to the expeditions with route information and their requirements. Your guide will drive his own 4x4 truck/car and assist you on technical passages. 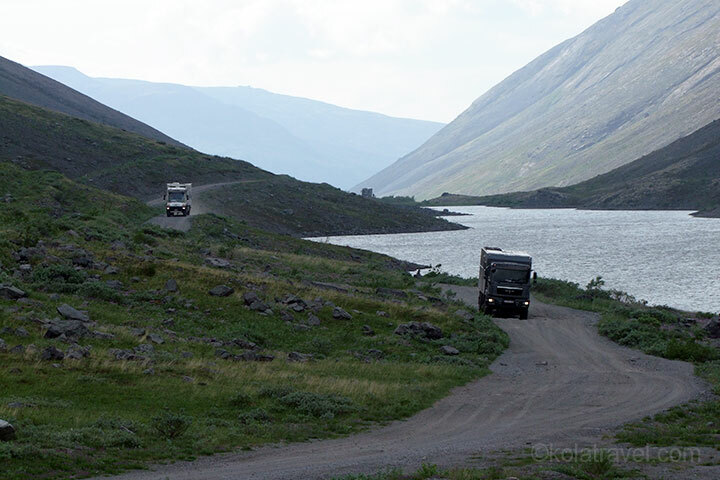 The truck/car carries will be used as try-out by crossing rivers and difficult passages, for carrying additional luggage, common tools for possible repairs and for participants who want to experience the "real deep" Kola Peninsula as a passenger. If you want to be part of one of the ultimate off-roading tours but don't have time for the 3-day drive there and back, or don't think you have a capable enough 4x4 then you can fly out and rent a 4x4 car (Mitsubishi Pajero or Nissan Patrol) from us OR have a seat in the "4x4 bus", an army troop carrier which has absolutely astounding off-road capabilities and with the aircraft seats in the back is really comfortable to travel in!! What's more, the costs are the same per person as coming in your own vehicle! The price is fixed per group, depending on the amount of days and length of the expedition. The more participants the cheaper the expedition per participant. The price includes: guide/translation service, support service by 4x4 car/truck. The price does not include: accommodations, meals, fuel, vehicle costs, entrance fees for museums a.s.o, repatriation costs, visa inviations and insurances. 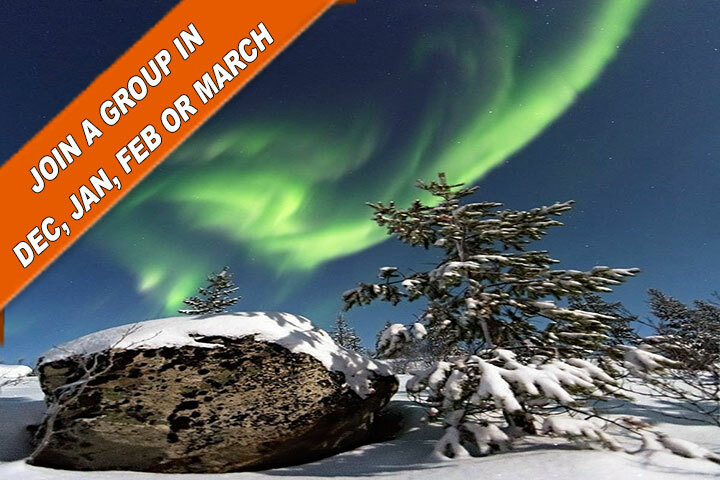 Optional we can provide you with overnight places and excursions on the way to/from the Kola Peninsula, meals during the expedition, entrance fees for museums, repair and repatriation of your vehicle, rental of jerry-cans, high-lift jacks, tents, visa inviations and insurances. 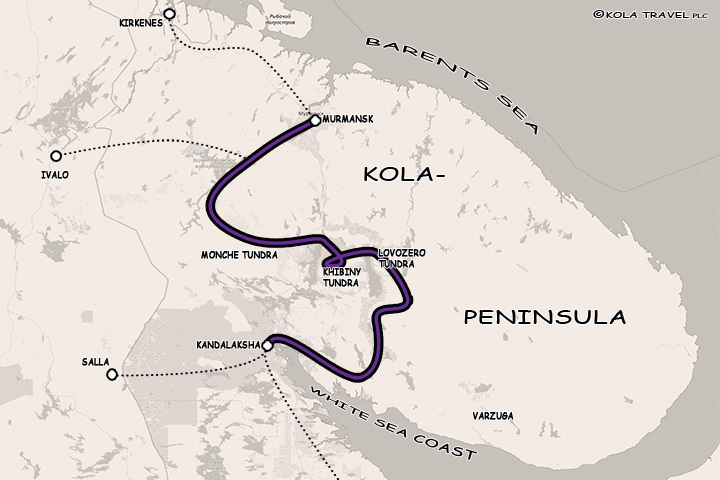 Both long-distance driving to Kola Peninsula and off-roading are considered hard driving conditions for your vehicle so we recommend that you give your vehicle a comprehensive service before you leave, as if it is not in tip top condition many days of off-roading is not going to make it any better. A detailed checklist will be sent to you when you register. Sounds too much to believe? Just look at the sliders of each off-road expedition full of photos of the Past expeditions we’ve been running since 2004.